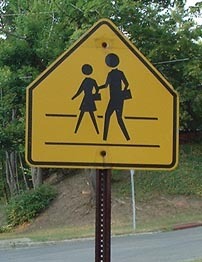 On August 4th, 2002, Crossing Man was abducted from the streets of Ithaca, New York. At the time of his abduction, he was in the middle of the execution of his eponymous duties (i.e. crossing the road). We have been receiving reports of Crossing Man sightings across the nation - indeed, across the world - and are hoping to track him down. Crossing Man's current status, re: his abductors is as of yet unclear. Some reports that have come in suggest that he was able to escape from the kidnappers, and has taken to traveling on his own (having some fairly sordid experiences on the way). We would dearly like to get back in touch with Crossing Man, and remind him of his duties, not only to his family, but also to the streets of Ithaca. We have compiled a collection of sightings that have been made to date, a map of which can be seen to the left, along with all information about the sighting we have. If you make a sighting, please contact us with the date, time, and location thereof. And Crossing Man, if you read this - Please come home.